Amidst all the Brexit carnage and panic, a moment of fun, well high farce anyway. The witless and ill-starred Transport Secretary Chris Grayling managed to prepare for a no-deal Brexit by agreeing a £14million contract with a ferry firm that didn’t own any ferries. Mystifyingly he and the deal stayed in place until the latter finally fell to bits. Calls for his resignation appear to be falling on deaf ears, especially his own since he, as ever, stalwartly refuses to apologise or admit wrongdoing. Looking back on his career, he has staggered from one crisis to another, being promoted time after time for no apparently obvious reasons. Most recently he was responsible for a calamitous reworking of railway timetables, shelved plans to regulate the use of drones shortly before they brought Gatwick to a standstill, and then outshone himself with this latest misstep. Born 1 April 1962, he moved from university into the media, then public relations and thence into politics. 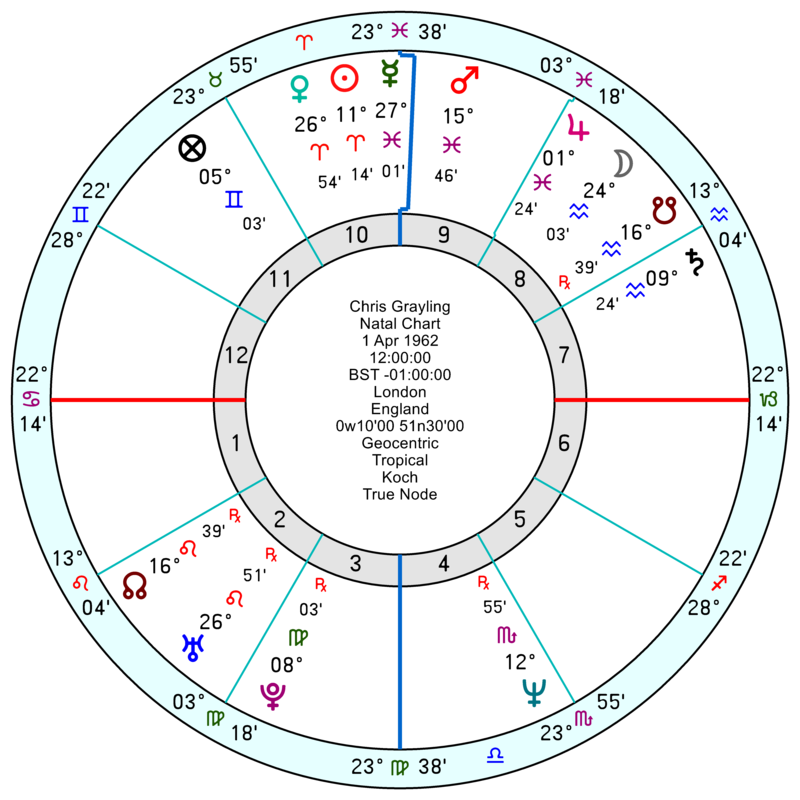 He has a pro-active Aries Sun on the apex of a Yod to Neptune sextile Pluto. Such an emphasised Sun will make it difficult for him to modulate his use of will-power, pride and authority. He needs to learn to rein in his tendency to abuse his power. 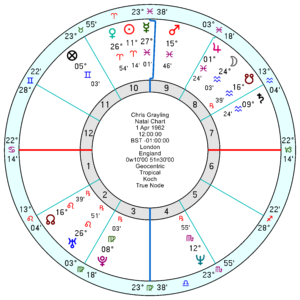 His Sun is also exactly in opposition to his Neptune/Pluto midpoint which will lead to confusion and the pursuit of odd ideas. He also has a pushily-confident Jupiter opposition Pluto; and an ultra-determined Pluto opposition Mars – with his Pluto exactly in opposition his Mars/Jupiter midpoint giving him unshakeable self-belief. 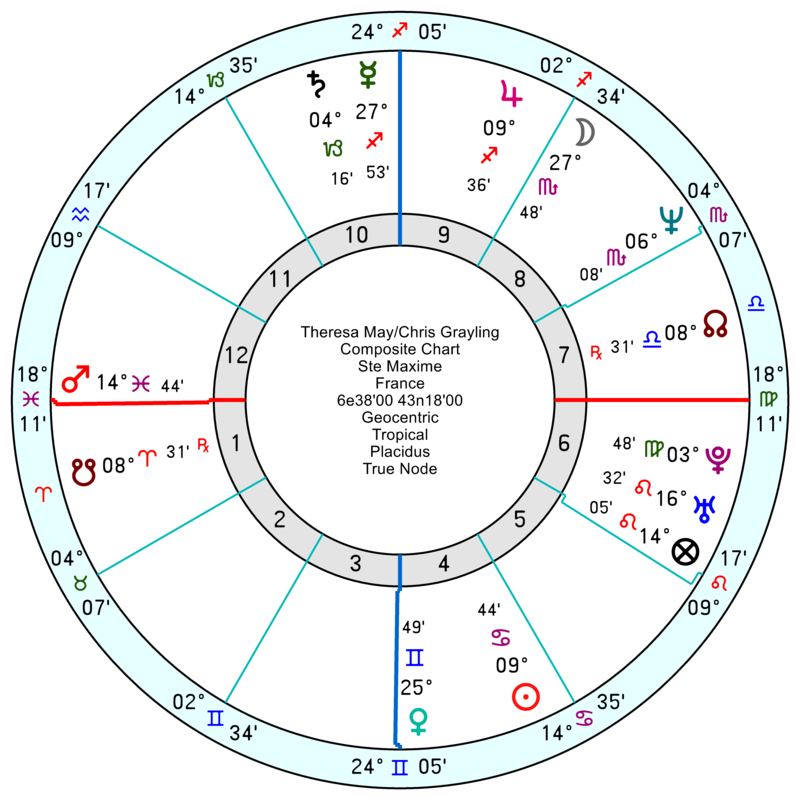 His Uranus conjunct Regulus opposes his accident-prone Mars/Saturn midpoint. So he’ll lurch merrily from one self-created mishap to the next, while bullshitting his way out of trouble every time. 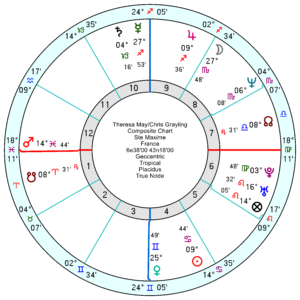 This month looks swampy and failure-ridden with tr Neptune conjunct his Mars and that returns this November/December. His relationship chart with Theresa May is business-like, opportunistic, a tug of war for the upper hand and surprisingly private. There’s nothing much to suggest an outright rupture either on this or his own personal chart (without birth times). There are people and I’ve known a few who rise from failure to failure and never seem to look back. Weird world. Unfortunately, he comes from a constituency that would vote for a tin of spam if it had a blue ribbon on it. I have no idea who this guy is (I live in Canada) but what a funny, terrific read this was! Your dexcriptions and descriptive words are hilarious. All that great English humour just withers on the vine as one heads up the ambitious political path, doesn’t it? Farce is the new normal, that’s for sure. Sad but true. Anyways… great, pithy and smart post! 14million pound contract…with a ferry company…having no ferries! Outstanding! Cheap compared to the lunacy of HS2 over which Grayling presides. Estimates suggest is going to cost more than £60 billion many times more than that other folly Trump’s proposed wall with Mexico. At 400 million per mile it will be the most expensive rail line ever built. Meanwhile the rest of the UK transport network is falling to pieces. 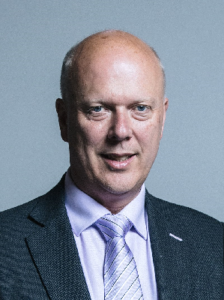 The minister is not nicknamed “Failing Grayling” for Nothing”. It’s staggering. He could have just tarmacked over Beeching’s old lines, gifted everyone an electric car and still saved money compared to that. As if the British Public’s despair over the competency of this bodger can’t get any deeper, I see he shares a soggy Piscean Mars with TMay within a couple of degrees. No wonder our faith in the ability of the political class to govern us is at an all time low. How apt that he was born on April Fools Day.